I love the convenience of having canned black beans and other dried beans on hand. However, I don’t like the price of buying canned black beans. 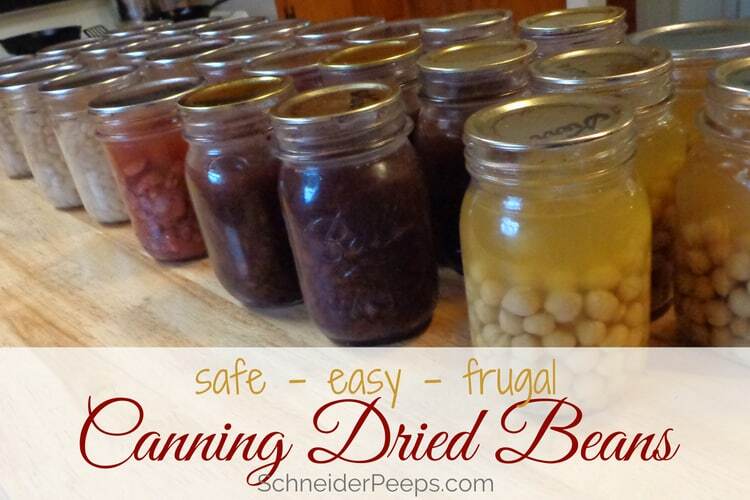 So one of the first things I learned to can in my pressure canner was how to can dried beans. Every year I buy dried beans in bulk and spend a couple of days canning dried beans while I do other projects around the house. It’s such a life saver and a money saver. I don’t usually can pinto beans since I make a large pot every couple of weeks and then make various meals with it. I use my freezer to store the cooked pinto beans until they get used. This works for me but you can certainly make home canned pinto beans using these instructions. I like to can black beans, kidney beans, white (Navy) beans, and chickpeas (garbanzo beans). Lentils cook up very quickly and don’t need to be soaked so I don’t bother canning lentils. I like to keep track of all my home preserved food with these worksheets. It’s so nice to know how much we go through each year so I can make what we need without making too much. You can get these worksheets emailed to you by filling out the form below. 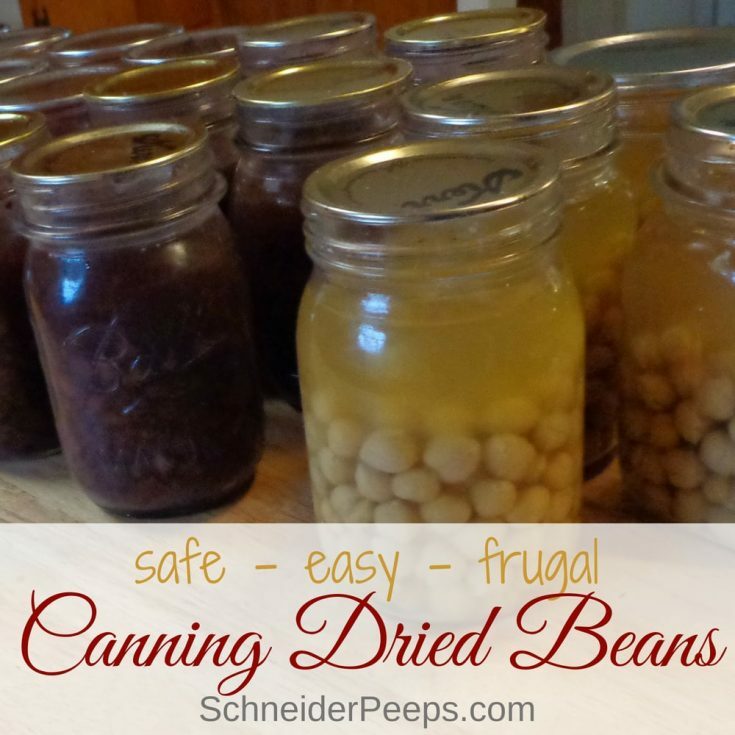 First off, you absolutely have to have a pressure canner (not a pressure cooker like an Instant Pot) to make home canned dried beans. If you don’t have a pressure canner and want to keep cooked beans on hand, I suggest you cook a couple of pounds of dried beans at a time and freeze them. Here are some tips for freezing beans in glass containers. To soak or not to soak?…that is the question. 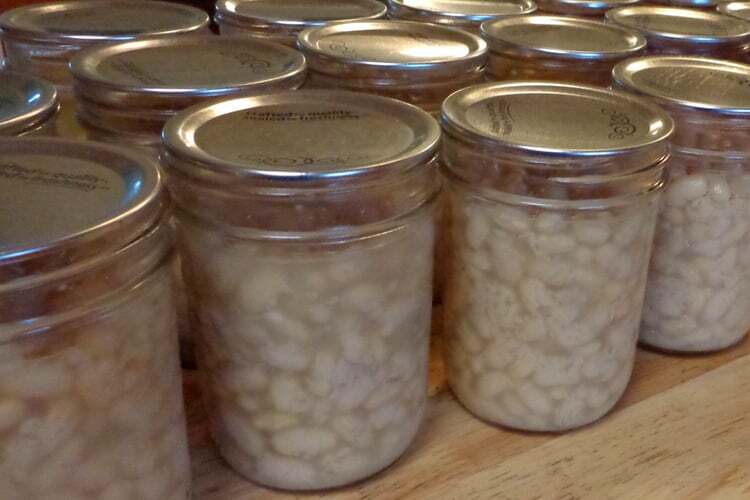 According to the National Center for Home Food Preservation and Ball® dried beans need to be soaked before canning. Beans expand as they cook and if there’s not enough room in the jar for them to expand they could bust the jar. Soaking let’s the beans expand before being put in the jar so there’s no risk of busted jars due to the beans expanding. Traditionally we soak beans before cooking to make them easier to digest which makes them less gassy. Some members of my family can eat beans all day long every day and not get gas, others have to be more careful. So, because I like to stretch my grocery budget by serving beans quite often, I soak dried beans before cooking or canning. 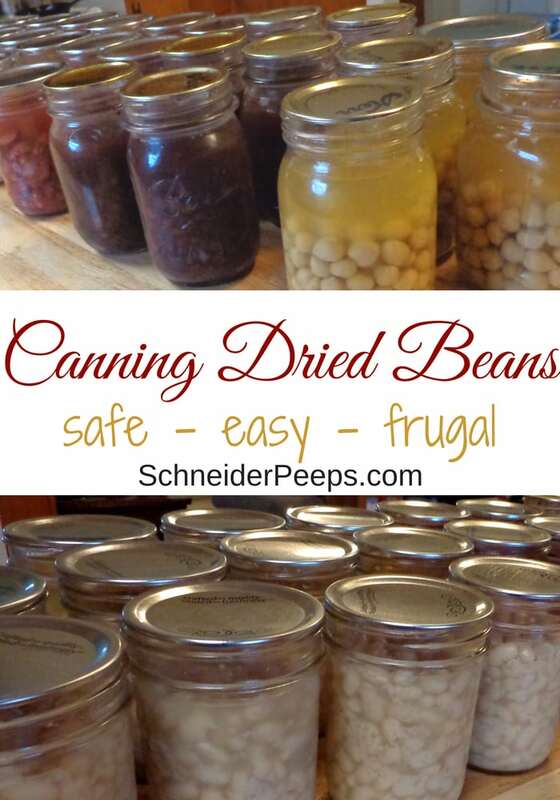 One reason people want to try canning dried beans without soaking is because they think they’ll end up with mushy beans or beans that are falling apart. I’ve not found that to be the case when soaking dried beans before canning them. There are people who can dried beans without soaking and they’re just fine. I don’t think the soaking or not soaking issue is a safety issue in the same way that trying to can low acid foods in a water bath canner would be. But I also don’t think it’s a huge time saver to not soak the beans first, so I soak them. The night before I’m going to can dried beans I soak enough beans for three loads in my pressure canner. My pressure canner will hold 17 pints which is what I normally can dried bean in or 7 quarts. Depending on the dried bean, it takes approximately 3/4 pound (or 12 ounces) of dried beans to fill one quart canning jar or two pints. So I will usually soak 15-18 pounds of dried beans for canning the next day. I soak each variety separately and can just one variety per jar. You can do a quick soak if you didn’t soak the beans the night before. Rise the beans first and pick out any that don’t look good and pick out any small pebbles that might be in them. Put the beans in a large stockpot and over them with water by at least 2 inches. Bring the beans and water to a boil and boil for two minutes. Reduce the heat to low and simmer the beans for an hour. I’ve had to do this when I forgot to soak dried kidney beans before canning chili con carne. It takes 90 minutes of processing time to pressure can dried beans. That means each batch from start to finish takes about 2.5 – 3 hours. This includes the time for the pressure caner to pressurize and depressurize. If I have left over dried beans after the third batch I’ll just cook them together on the stove and freeze them to add to soups. After soaking the beans, either overnight or by the quick soak method, drain off the water and rise the beans. Wash out the stockpot and fill it with fresh water. Add the beans to the water and boil for 30 minutes. This doesn’t have to be a rolling “the pot is overflowing” boil, a gentle boil will be just fine. While the beans are boiling, wash the jars and lids in hot soapy water. You don’t have to sterilize them since the process time is longer than 10 minutes. Check the jars for any nicks or cracks. 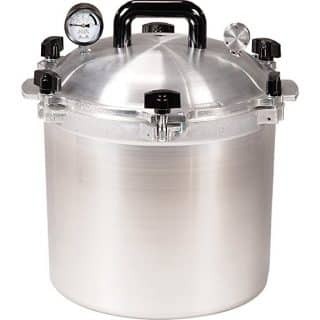 Prepare the pressure canner according to the manufacturer’s instructions. Turn the heat under the beans down to low to keep them warm. Fill the hot jars with the beans and cooking water leaving a 1″ head space. You can add 1/2 tsp salt to each pint and 1 tsp salt to quart if you want to. I don’t because I like to add the salt as I’m cooking but a lot of people do. Put the jars in the pressure canner and seal the canner. Process the dried beans for 90 minutes adjusting for altitude as needed. After the beans are finished processing turn off the heat and let the pressure canner depressurize. When the pressure canner is completely depressurized open the lid and remove the jars. Set the jars on a towel on the counter or table and them cool. Once completely cooled (this will take several hours) remove the bands and check the seals. Wipe down the jars and store in the pantry or wherever you store your home canned food. If any lids didn’t seal, I pour most of the liquid out and put the jar in the refrigerator to get cold and then the freezer to use first. If most of the liquid is out the jar won’t break in the freezer. Most families can probably can an entire year’s worth of dried beans in a day or two and for under $20 – that’s such a time and money saver. Use this method to safely can any dried beans - pinto beans, black beans, kidney, Navy or chickpeas (garbanzo beans). Rise the beans first and pick out any that don’t look good and pick out any small pebbles that might be in them. If you don't want to soak the beans overnight you can quick soak them.Put the beans in a large stockpot and over them with water by at least 2 inches. Bring the beans and water to a boil and boil for two minutes. Reduce the heat to low and simmer the beans for an hour. After soaking the beans, either overnight or by the quick soak method, drain off the water and rise the beans. Wash out the stockpot and fill it with fresh water. Add the beans to the water and boil for 30 minutes. This doesn't have to be a rolling "the pot is overflowing" boil, a gentle boil will be just fine. While the beans are boiling, wash the jars and lids in hot soapy water. You don't have to sterilize them since the process time is longer than 10 minutes. Check the jars for any nicks or cracks. Prepare the pressure canner according to the manufacturer's instructions. Fill the hot jars with the beans and cooking water leaving a 1" head space. You can add 1/2 tsp salt to each pint and 1 tsp salt to quart if you want to. I don't because I like to add the salt as I'm cooking but a lot of people do. Set the jars on a towel on the counter or table and them cool. Once completely cooled (this will take several hours) remove the bands and check the seals. Wipe down the jars and store in the pantry or wherever you store your home canned food. If any lids didn't seal, I pour most of the liquid out and put the jar in the refrigerator to get cold and then the freezer to use first. If most of the liquid is out the jar won't break in the freezer.